Hundreds of Palestinian villagers regularly undertake a non-violent march, short yet symbolic, to the separation wall built by Israel on their land. The protesters, marching from the village of Bilin, regularly meet a violent response from the Israeli army. “The village of Bilin is literally on the frontline of Israel’s confiscation of Palestinian land and the construction of its separation barrier,” Jacky Rowland, Al Jazeera’s correspondent reporting from the village, said. “Later today the villagers of Bilin will protest the fact that not only they, but also five neighbouring villages, have lost their land which has been seized to build an Israeli settlement. “This huge settlement will result in 40,000 Jewish settlers living on occupied land here in the West Bank and as prime minister Netanyahu is planning to give the go ahead for even more of these settlement homes to be built,” she said. 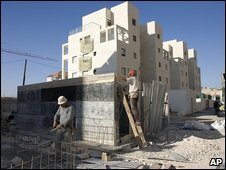 Before considering US demands for a construction freeze, Israeli prime minister will approve plans to build hundreds of new homes on Palestinian land in the occupied West Bank. On Friday, aides to Binyamin Netanyahu were quoted in Israeli media as saying that although the prime minister would consider a settlement freeze, he first planned to authorise the new building work. The comments mark the first time an aide has said in the name of the prime minister’s office that a freeze could be imminent. However Palestinians are likely to be angered by plans about new settlements. They have said they will not resume peace talks unless Israel suspends construction on lands which they want for a future state. The Israeli move has been criticised by Saeb Erekat, the chief Palestinian negotiator, who said “the only thing suspended by this announcement will be the peace process”. Israel will also be put at odds with the US administration as president Obama has been pushing for a settlement freeze. Israel had already responded “with total defiance” to US calls for a settlement freeze. According to a Likud legislator, Danny Danon, Netanyahu can expect a fight over any decision to halt or even slow settlement building. “Most members of the Likud, most members of the coalition, don’t think that what he’s about to do is the right step,” he told Israel Radio. Over the settlements issue, Netanyahu is “being pulled in two directions” said Jacky Rowland, Al Jazeera’s correspondent in Jerusalem. “On the one hand, you have the Americans, Palestinians and the international community for that matter who are calling for a permanent freeze,” she said. An unnamed aide was quoted in Israel’s Jerusalem Post newspaper as saying that Netanyahu intended to sanction new settlement construction ahead of a freeze as well as sanctioning the continuation of work on 2,500 housing units already under way. The aide added that Israeli prime minister would require the Arab world to take steps toward normalising relations with Israel, in exchange for a suspension. Palestinians want the West Bank as part of a future state, along with East Jerusalem and the Hamas-ruled Gaza Strip. But for decades, the number of Israeli settlers has steadily increased, to reach today’s figure : about 300,000 Israelis live among about 2.5 million Palestinians in the West Bank.